Earlier today, I listened to a reader marvel over a first experience of Dashiel Hammett, author of some of the foundational American hard-boiled detective fiction. This reader was close to 70 years old and a newcomer to Hammett's work, and thrilled. "I understand it's the roots of noir," she added cheerfully. Indeed. 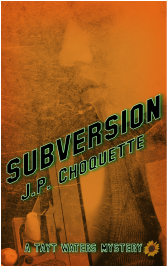 One of the nice parts about American detective fiction is that the roots keep nourishing today's many branches. Reading Ed Gorman's newest release, his 10th Sam McCain investigation, makes it clear that the style of tough men and well-garbed women continues, and Gorman's decision to place the novel in 1971 -- a year when the song "Riders on the Storm" by the Doors poured from every radio -- lets this savvy author frame a story of the grief and pain of Vietnam War veterans, returning to an America shocked by images of war's brutality. 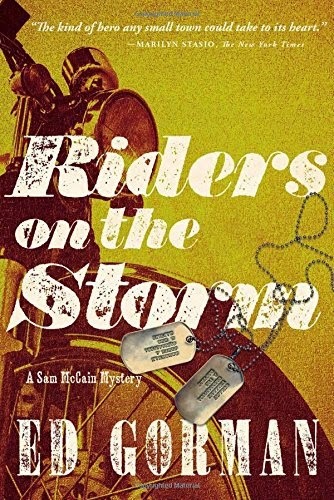 In RIDERS ON THE STORM, McCain, barely functioning again after his own National Guard medical emergency, returns to his home in Black River Falls, Iowa -- someplace close, maybe, to Gorman's own Cedar Rapids -- and rises to a distress call from his buddy Will Cullen. Will's war-related injury and posttraumatic stress disorder (PTSD) are way worse that McCain. And he's got a marriage to try to fit back into. McCain takes on the burden of Will's wife's desperation, as Will gets fingered for a politically charged murder that fits into a local manipulator's election needs beautifully. But suspicious motives for others aren't enough to get Will out of the accusations, especially when he's made a confession of sorts, and motives abound. "Seems to me if Donovan was really our friend, you'd want to help me find out who really killed him." "Right. And Lee Harvey Oswald didn't really kill President Kennedy." "I wasn't a big fan of Donovan's," I said quietly. "But he deserved better friends than you." The teeth again. He started to say something, then shook his head. He said nothing more to me and neither did the sumptuous Annette as I walked out the front door. Fans of the McCain series will find this a very satisfying round of plot and pursuit, with its own inner sense of justice. Those who feel the Vietnam War was "their war" -- like me -- will also get a sense of replay of the factors that made the time so confusing, and so sad. Which, it must be admitted, is the perfect ambience for a hard-boiled detective novel, and Gorman works the terrain well. It's tempting to start looking for the earlier nine titles, which began publication in 1999, working from the 1950s forward. I think I might go searching them out. In a hard-boiled sort of way. November 4 was Election Day, and the birthday of one of my long-gone grandfathers, and ... release day for the third (and final) Mara Dyer thriller: THE RETRIBUTION OF MARA DYER. When I reviewed the first of the trilogy, The Unbecoming of Mara Dyer, I wasn't sure whether I whether I wanted to get involved with the paranormal side of the character. But the character, ah, the character! Mara Dyer is one of the best ... tough, determined, sometimes so angry at what's been done to her and her friends and family that she's a menace, a danger, a disaster crashing into your reading room and your heart (or that's how it felt to me). The second book, The Evolution of Mara Dyer, filled the promises of the first and (I have to confess) induced me to place the earliest "pre-order" I've ever placed for a book ... I needed to know where author Michelle Hodkin would take this. Mara Dyer and a few other teens find themselves part of a complicated medical and psychological experiment tied to a mutant gene that sometimes stays quiet, and sometimes "manifests." And when it does affect the person hosting it, the gene produces paranormal abilities: the ability to persuade near-hypnotically by voice, or to hear someone's thoughts, or, in Mara's case, to damage and even destroy one's enemies. Threads from the earlier books revealed that the effects of this mutant gene were present among people for generations -- creating some of the powerful dark myths of humanity. What's not clear until the third book, though, is whether Mara must give up all the complex other parts of herself to fulfill where the gene leads (and whether she can ever rediscover her connection to Noah, another genetically influenced teen who's vanished) -- and, more urgently, whether the teens can hold their own against a sophisticated cabal of adults who variously want to treat them as experiments, manipulate them to change the world, or aim them like weapons without volition. This is neither a Hunger Games trilogy nor a Harry Potter adventure. Mara's genetic burden isn't likely to add up to a happy ending, and she's carrying a burden of guilt for her own actions that's rapidly crippling her emotionally. I wasn't fully satisfied with the ending -- like many other readers, I felt there were plot threads that hadn't quite come clear -- but I wouldn't have missed this for anything. It's left me a bit confused, a little heartbroken, on edge, questioning ... and wow, any book that does that, well, that's a book I want to re-read. Later. 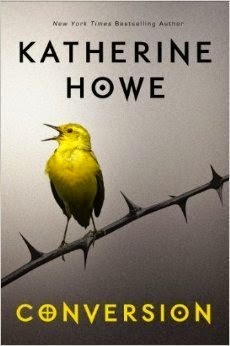 We had one of those mysterious married-couple-miscommunications on CONVERSION, Katherine Howe's intriguing exploration of a prep school in Massachusetts where the girls under the most pressure in their college applications are becoming ill, one after another. I thought Dave said I needed to read it; he can't recall ever hearing about it! Never mind, it was well worth getting a copy. New Englanders may guess from the setting -- Danvers, Mass., which was the site of the Puritan-era Salem Witch Trials -- that wrapping the students in a modern-day media circus can't disguise the contagion of their disorders, or the suspicion that these are being orchestrated in some way. The author's parallel story, among the original group of "Salem" girls, probes the life of the one accuser historically known to have admitted her illness wasn't a result of witchcraft. But even realizing the narratives are intentionally parallel doesn't spoil the quick and emotionally powerful movement of Howe's binocular plot. I enjoyed this, and I already know which teenaged girl I'm giving it to. Author website here. 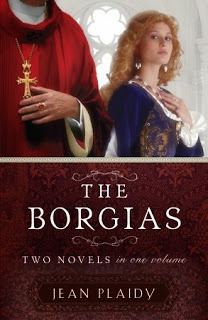 The publisher of THE BORGIAS by Jean Plaidy sent a copy here, as part of a promotion recently. I'm not sure what the timing represents -- the two historical novels that make up this chunky paperback feature Lucrezia Borgia, famous for her 15th-century life of intrigue (Madonna of the Seven Hills; Light on Lucrezia). Betrothed and finally married as a teen at a time when, among powerful European leaders, such contracts were common, Lucrezia wielded immense power as part of Italy's most forceful -- and maybe least gentle! -- family. Today her name is associated with both intrigue and poison. But when Jean Plaidy -- actually one of the many pen names of Eleanor Hibbert (you may know her better as Victoria Holt; check out her astounding literary life here) -- wrote this pair of novels in 1958, her research led her on a very different path. As a result, this pair of books is less in the mystery genre, and more along the line of a sweet and decent girl who became an assertive teen and then a victim of the sexism of her time. Plaidy's pacing and narrative hold up well, and the story still is fresh and surprising. But it's actually a bit tame compared to today's YA ficton! So if you're teasing a teen into history with the vicious side of the Borgias and similar nefarious figures of the past, consider adding this one to the stack for a surprising "other side" to the Borgia saga. I've set my copy aside for a playwright who may use it for reference. And I'll have a few more titles to mention before the holidays arrive. Back in the 1990s I enjoyed a Quaker mystery series from Irene Allen, but it looks like the four books ended around 2001 and the author has retired -- including perhaps retiring from her "day job" as a geology professor and author in that field, under her "real" name, Dr. E. Kirsten Peters. Now, with the November 11 release of BLUFFING IS MURDER from Tace Baker, we have the second in a fresh energetic series featuring amateur sleuth Lauren Rousseau. Like the author herself, Lauren is a linguist, and expects to be addressed as "Dr. Rousseau." But when the book opens, she's just headed into her first real summer break, the one that follows gaining tenure, when the career track makes some breathing space. And Lauren has extra flexibility because her habitual boyfriend Zac, who's been offering more commitment than she wanted, is flying out to Haiti for a family emergency. Lauren's on her own, and testing the he–she waters in her walkably cozy coastal Massachusetts town. So it's tough luck that one of her first summer adventures leads to her discovering the body of Charles Heard, a Trustee of the local land trust. Lauren's been more involved with her college than her town (where she's a relatively recent transplant), but she quickly learns multiple reasons for bad feeling against Charles Heard -- including the way the land trust where he's so influential has been holding back money slated to improve the town's school, so the kids aren't getting their fair share of programs. Even the language program's being cut, a blow that especially hits hard for Lauren, with her fondness for many languages. 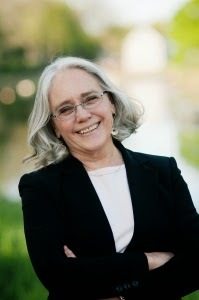 Author Tace Baker -- a pen name for Edith Maxwell, Massachusetts author of this series, a second one involving the "locavore" movement, and branching into an upcoming third under the pen name Maddie Day -- brings a good background to the book, with her own doctoral dissertation in linguistics, as well as many other writing hats. But what I enjoyed in particular is her sense of the emotional life of a smart, savvy, and single woman of a certain age -- mid thirties, here -- who's very, very work-capable but who's somewhat insecure about whether she is in or out of the dating game, and as a result, doesn't really check into or trust her own misgivings about some of the men who admire her. Because it's Lauren's casual acceptance of what her martial arts teacher Dan Talbot tells her, and the invitations he provides, that makes her vulnerable. And that's what takes her further into sleuthing than is wise ... and puts her under threat repeatedly. Doubling the plot thread (and Lauren's emotional vulnerability) is the long-past death of this sleuth's father -- something she hasn't had time to look into until now. Is her hunt for that truth also putting her at risk? Last but not least, what does Lauren bring to the sleuthing skills table as a result of being a lifelong Quaker, with a tradition of silent meditation and a search for divine guidance? If, like me, you enjoyed that earlier series by Irene Allen, or you're curious about Quakers in fiction, or you enjoy a strong and vibrant amateur sleuth with an occasional but very human slip of judgment, check out this series. Book one is called Speaking of Murder (2012). The series is from Barking Rain Press -- which offers the first four chapters of BLUFFING IS MURDER free, in exchange for your contact info (click here) -- and the author will have a few touring events (see her website), as well as a number of online interviews. Thanks, Edith/Tace (and Maddie!) for this enjoyable traditional mystery! Each new death in our lives echoes against the earlier ones, and sets them ringing in us like a string of bells, brushed by a passing hand. Sometimes it's gentle music -- and sometimes discordant. But I have never been to a funeral, or read an obituary, without thinking of some long-passed friend or relative, and feeling an amplified loss. How much more so must it be for a private investigator like Charlie Parker of Maine, who's seen so many tragedies. 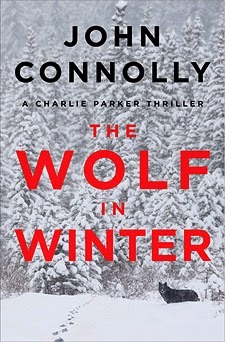 As THE WOLF IN WINTER from John Connolly opens, he and his partners in, well, vengeance maybe, or crime protection, think they've finally cornered a criminal mastermind who's killed one of their friends. There will be many chapters to go before the impact of the scene comes back into the action -- and the next chapter, from the point of view of a wolf just arriving from Canada into Maine in bitter cold, will also seem obscure for a while. But if you're a series reader, you're already aware, in the echo with earlier Charlie Parker investigations, that the wolf could parallel either a psychopathic killer or, in the sense that it's alone with its wounds, Charlie himself. Then the action takes over. A homeless man in Portland, Maine, Jude, has been trying to track down his daughter. It looked like he was finally about to have "family" again -- and then his daughter disappeared, and the treatment center further north where she'd been recovering is baffled, too. Then Jude dies, in circumstances that Charlie quickly realizes are staged murder ... and in a way that leaves Charlie Parker the emotional legacy of taking Jude's "missing persons" case. Where did that young woman vanish? "I'm searching for a missing girl. If she's alive, she's in trouble. If she's dead, someone else is. As an individual who professes to be a man of god, I'd suggest that your compassion is currently misdirected." Warraner plunged his hands into the pockets of his jeans as though he feared the damage he might otherwise inflict on me. He was a big man, and strong as well. If he got his hands on me, he'd do some harm. Of course, I'd shatter one of his knees before he got that close, but it wouldn't look good on my résumé. Still, all of his weight was on his left leg, which was ramrod straight. If he moved, I'd take him. Warraner breathed deeply to calm himself and recover his dignity. The moment passed. "You know nothing of my god, Mr. Parker," he said solemnly. But Charlie has already guessed a lot about what's wrong in the town, and if he still has a hope of finding the missing girl, it's small, and growing fainter. He believed that men created gods as much, if not more, than gods created men. If this old god existed, it did so because there were men and women who permitted it to continue to exist through their beliefs. They fed it, and it, in turn, fed them. It's necessary to accept that level of presence of the "paranormal" in this page-turner, and maybe a wee bit more, but ... I'm a hard-core, non-paranormal reader, and THE WOLF IN WINTER struck me as making complete sense. When the wolves of greed and pride are loose in the landscape, there's going to be an echo, a response. Those bells are ringing again.